In 1998, Ian Foster and Carl Kesselman introduced a whole new concept in computing with the first edition of this book. Today there is a broader and deeper understanding of the nature of the opportunities offered by Grid computing and the technologies needed to realize those opportunities. 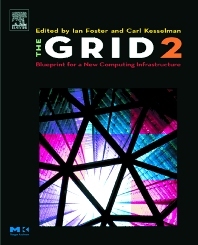 In Grid 2, the editors reveal the revolutionary impact of large-scale resource sharing and virtualization within science and industry, the intimate relationships between organization and resource sharing structures and the new technologies required to enable secure, reliable, and efficient resource sharing on large scale. Foster and Kesselman have once again assembled a team of experts to present an up-to-date view of Grids that reports on real experiences and explains the available technologies and new technologies emerging from labs, companies and standards bodies. Grid 2, like its predecessor, serves as a manifesto, design blueprint, user guide and research agenda for future Grid systems. "Foster and Kesselman have done a great job in documenting the promises and challenges of GRIDs as they evolve from their distributed computing roots to support the virtualization of applications." --Robert Aiken, Director of Engineering Academic Research and Technology Initiatives (ARTI), Cisco Systems Inc.
Ian Foster is Senior Scientist in the Mathematics and Computer Science Division at Argonne National Laboratory, where he also leads the Distributed Systems Laboratory, and Associate Professor of Computer Science at the University of Chicago. His research concerns techniques, tools, and algorithms for high-performance distributed computing, parallel computing, and computational science. Foster led the research and development of software for the I-WAY wide-area distributed computing experiment, which connected supercomputers, databases, and other high-end resources at 17 sites across North America (a live experiment at the Supercomputing conference of 1995). Most recently Carl Kesselman received international recognition for GUSTO, the world’s first high-performance computational grid. GUSTO pushes the technological envelope by using high-speed networks and software to provide global access to advanced supercomputers and other devices.